Isagenix® Co-Founder and President Jim Coover put IsaLean® Pro in the spotlight at New Year Kick Off. Few products are better for your body (and your wallet!) than IsaLean Pro. Incorporate IsaLean Pro into your personal routine and your business to see both physical and financial results! 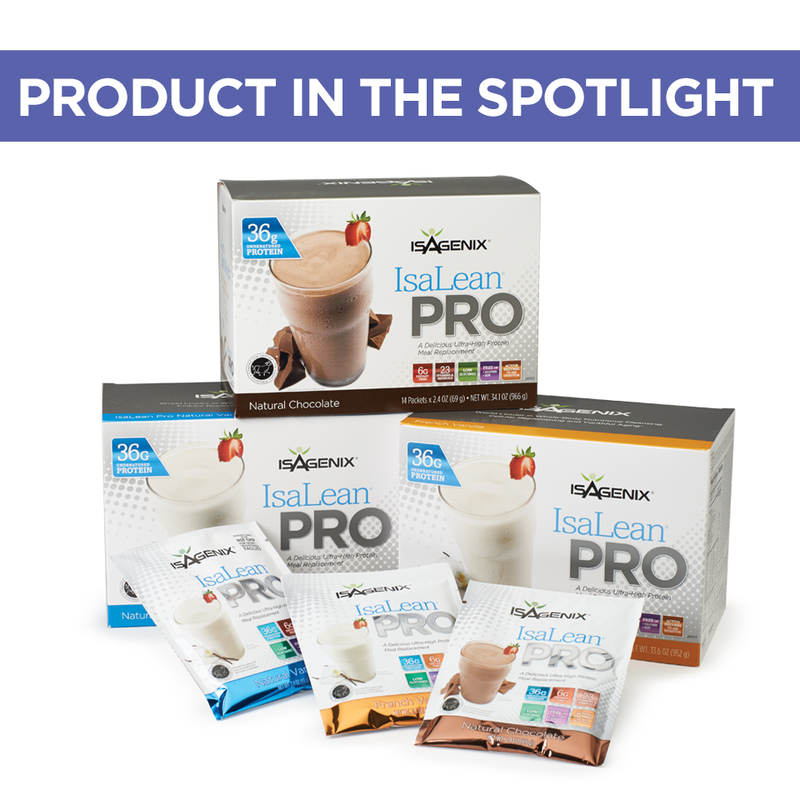 IsaLean Pro meal replacement shakes are available in three fantastic flavors: Natural Vanilla, Natural Chocolate and French Vanilla. Each shake is a complete meal replacement that features 36 grams of undenatured whey and milk protein to keep you feeling full until your next meal while fueling your muscles with the branched-chain amino acids they need for optimal muscle repair, growth and strength. More protein can help you keep muscle as you age. After age 30, adults lose on average a half pound of muscle each year. More protein can help you overcome a weight-loss plateau. Higher protein diets increase satiety and stimulate fat burning. More protein can help you build muscle faster. High physical demands on the body require more protein to repair and build muscle. “Science has determined optimal protein intake for muscle building and fat burning is approximately 110 grams ideally spread across the day. That’s what has guided our product development and evolution,” says John Anderson, Isagenix Founder and Master Formulator. Take it to the next level with IsaLean Pro, specialized nutrition for athletes, active people and teens who want to gain muscle and for those trying to break through weight-loss plateaus or lose stubborn belly or harmful visceral fat. It’s also for older adults who want to prevent age-related muscle loss. IsaLean Pro users have a higher average basket size (meaning, they order more products at one time) and higher levels of retention – making it a great business-building product. On average, the average basket size of people who order IsaLean Pro is $100 more than those who don’t! As for retention, nearly 75 percent of IsaLean Pro purchasers make another purchase in their second month. And, DOUBLE the number of people who order IsaLean Pro in their initial purchase are still purchasing in months 7 to 12! “IsaLean Pro was introduced last year out of a desire to provide the ultimate in convenience for achieving that magical 36 grams of protein. Since its introduction, it has become one of the fastest-growing products in the Isagenix line,” Says Jim Coover Isagenix Co-Founder and President. Start adding IsaLean Pro to your personal and business arsenal today to create momentum for your personal and professional goals! Sources: 1. Mithal et al. Impact of nutrition on muscle mass, strength, and performance in older adults. Osteoporos Int 2012. 2. Belza et al. Contribution of gastroenteropancreatic appetite hormones to protein-induced satiety. Am J Clin Nutr. 2013. 3. van Loon LJ, Gibala MJ. Dietary protein to support muscle hypertrophy. Nestle Nutr Inst Workshop Ser. 2011;69:79-89.